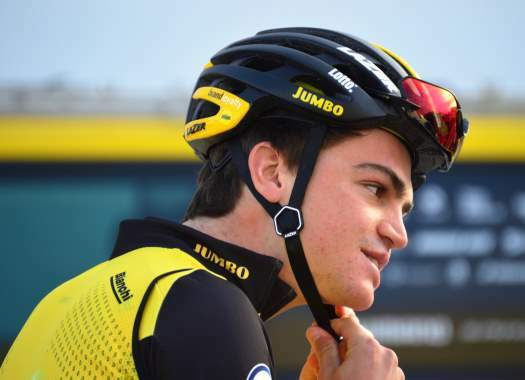 LottoNL-Jumbo's Sepp Kuss has won the second stage of the Tour of Utah. This is the first professional victory for the American rider and allowed him to take the overall lead of the race. The second stage of the American race was 142.6 kilometres long in and around Payson with one first category climb, from which the riders descended to the finish line. The escape of the day was formed at around 110 kilometres to go and included riders like Evan Huffman, Sam Bassetti and Griffin Easter. The front group got an advantage of more than four minutes over a peloton that was pulled by BMC Racing Team, which was trying to protect the leader's jersey of Tejay Van Garderen. The climb of the day took a toll in the breakaway and left Easter riding on his own. At around 51 kilometres to go, LottoNL-Jumbo's Sepp Kuss attacked from the peloton, caught Easter and then left him struggling behind. The American crossed the top of the climb on his own and started a fast descent in which he reached a speed of around 80 kilometres per hour. Meanwhile, Van Garderen was the only rider of his team in a reduced peloton until Brent Bookwalter came back from behind to lead the group once more and without the help of any other team, to try to reduce the gap with Kuss. The rider of LottoNL-Jumbo crossed the finish line on his own with a big enough advantage to take the leader's jersey. His teammate Neilson Powless arrived at the finish in second place at 29 seconds from Kuss and Rally Cycling's Kyle Murphy was third. Van Garderen drops to the third position of the General Classification at 25 seconds from Kuss.